A mini “beltline” running through the heart of Buckhead connecting the Atlanta History Center to Park 400 was among the big ideas unveiled during a public meeting Feb. 27 at Atlanta International School. Spearheaded by a number of regional stakeholders, including the Buckhead Community Improvement District, Livable Buckhead, the Buckhead Business Association and many more, BUCKHEAD REdeFINED is an effort to update the 2001 Atlanta Regional Commission Livable Centers Initiative. The idea is to create the concepts and concrete plans to help transform the area over the next 30 years into a more livable, accessible, connected place people want to live, work and play. According to researchers, more than 98 percent of the people who work in Buckhead’s core - which essentially is the area around Lenox Square down Peachtree Road to Loudermilk Park - live elsewhere in the city. Even with the number of apartment units coming online, there is a gap of 10 jobs for every one unit, and that gap is expected to increase with projected job growth. That right there is the chief reason for the near-nonstop traffic plaguing the area. 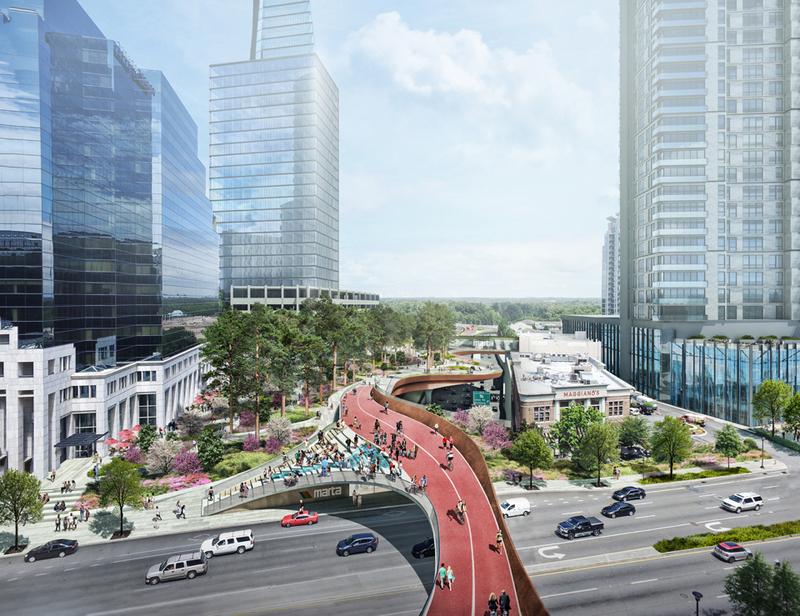 In order to improve connectivity the plan calls for a Buckhead “beltline” that would pass through Buckhead Forest and Peachtree Park and connect to Path 400 and the Atlanta History Center. Other concepts include an on/off ramp for Georgia 400 at East Paces Ferry Road, directly behind Lenox Square. Another proposal called for reducing Piedmont Road from six lanes to five, with a turn lane down the center. There were also ambitious plans to work with private developers to create public parks as part of future developments. And, of course, Park 400, an elevated park over 400 that would tie the area to the north of 400 to the area to south together, was a big part of the proposal. Farther off in the future is a plan to remake Lenox Road at Peachtree, and possibly do away with the confusing ramps that currently make walking through the area impossible. One of the speakers noted there is a “No Pedestrians” sign just north of the intersection. Media reports, including this one in the Northside Neighbor newspaper, are indicating Buckhead ReDefined is seeking additional input and going back to the drawing board on some of the bigger ideas. It is worth watching this process as this could have a major impact on how Buckhead evolves over the next several decades. You can visit it by clicking here. What improvements would you like to see in Buckhead over the next 30 years?